The post Missouri teacher suspended for allowing student to wear Ku Klux Klan robe appeared first on theGrio. The post KKK flyers discovered in South Baltimore’s Riverside neighborhood appeared first on theGrio. The post Crazy Train! NRA blasted for putting KKK hoods on popular children’s toy appeared first on theGrio. 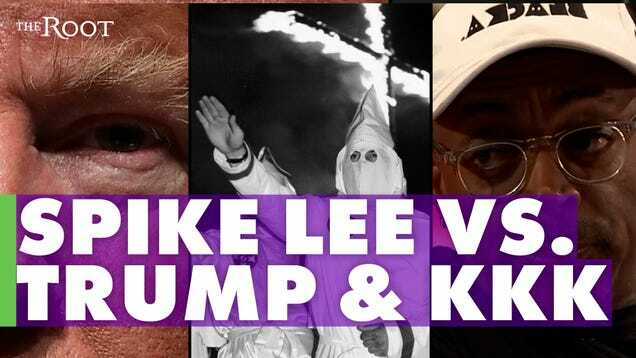 The post KKK flyers recruiting new members flood Philadelphia suburb appeared first on theGrio. The post Six ugly truths Spike Lee’s ‘BlacKkKlansman’ exposes in the wake of Charlottesville appeared first on theGrio. The KKK is allegedly trying to recruit Generation Z into its rans using propaganda and, of all things, the sweet enticement of candy. The post Ku Klux Klan leaves behind sweet treats and flyers to recruit kids in Upstate New York appeared first on theGrio. The post Recruitment letters for the KKK are showing up all throughout Virginia appeared first on theGrio. Wait, did Calif. teacher really approve KKK costume for student’s class project? The post Wait, did Calif. teacher really approve KKK costume for student’s class project? appeared first on theGrio. The post Racist attorney claims free speech after police investigate KKK fliers in Virginia appeared first on theGrio. The post Girls basketball team faced racist KKK signs in Virginia locker room appeared first on theGrio. Residents of Saratoga Springs in upstate New York were shocked when the found that the Loyal White Knights of the KKK distributed Valentines-themed flyers in their community. The post Upstate New York residents shocked by Valentines-themed KKK flyers appeared first on theGrio. The post Texas students leave KKK pancake message for Black IHOP server appeared first on theGrio. Last year, multiple instances of racist graffiti at the Eastern Michigan University campus sparked fear and protests. The post Racist graffiti on college campus turns out to be doing of Black ex-student appeared first on theGrio. An anonymous group calling it self "Indecline" stirred up controversy after they hung eight figures wearing Ku Klux Klan garb from a tree. The post Activist group hangs clowns dressed in KKK robes from tree appeared first on theGrio. The post Ex-Confederate capital eyes statues’ removal appeared first on theGrio. The post Two students suspended after posting racist image on Snapchat appeared first on theGrio. The post Man arrested for firing gun towards protesters at Charlottesville rally is KKK member appeared first on theGrio. The leader of a Ku Klux Klan group in North Carolina admitted that he was "glad" Heather Heyer died after being run over by a white supremacist. The post KKK leader is ‘glad that girl died’ during Charlottesville protest appeared first on theGrio. The post Internet confused by photo of Klansman with locs at KKK rally appeared first on theGrio. Robin Bell has been capturing the nation's attention with art projects in which he projects light images in prominent places throughout the nation's capital. The post Artist projects image of Jeff Sessions In KKK hood on DOJ building appeared first on theGrio. Students at a California high school were appalled when they spotted a girl wearing a KKK hood during lunch. 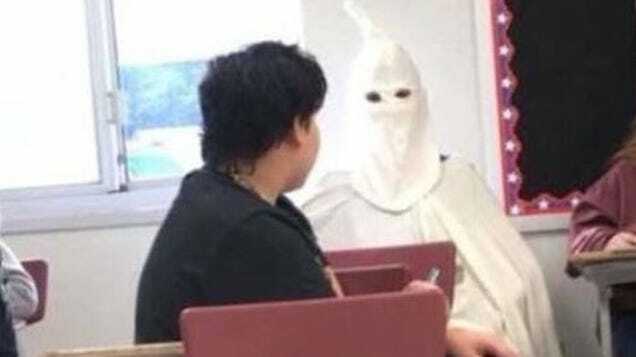 The post California high school student wears KKK hood during lunch time appeared first on theGrio. The Senate confirmation hearings for Jeff Sessions, Donald Trump's pick for attorney general, got off to a rough start on Tuesday morning. The post KKK-costumed protesters disrupt Jeff Sessions confirmation hearing appeared first on theGrio.